just read an article online that says Vanessa Selbst is retiring from professional poker. Among the reasons she states is that she doesn't feel good about promoting poker anymore. She is pursuing other ventures in hedge funds. She took a helluva bad beat in last years WSOP. Her Full House got smashed by Quads on Day 1 of play. She is among the least likable players...and I heard she was broke through the 2+2 forums. I can see her point. The constant travel regime is totally non-conducive to settling down. It gets old fast. I watched one of her first, if not thee first televised event. At first I was like wow way too aggressive. When she took it all down, then I was thinking, so take no prisoners approach makes a lot of sense. She has never changed to try and be what someone else wanted her to be. You always have to remember that the opposing players are not there to give you a chance in beating them. Hopefully she will be in action again. Hey. Quitting while you're ahead isn't the same as quitting. Maybe she just feels she wants to do something else in life. Vanessa selbst is the best player poker among women lovers game in my opinion, always follow your videos on YouTube and learn a lot with her. A shame a great player retire, more she has their reasons. Very lucky to it in the new ventures. Would not doubt that she is in a hole and decided to pursue other things she is a smart person I think she a law degree if I am not mistaken. Her aggro play leads to very swingy results. Unfortunally luck finally runs out one day. A while a back I saw her on tv once stick a quarter mill in with J5 preflop against a pretty solid player it may have worked if he didn't have Aces. She was a good player but with her aggression it was only a matter of time before she jammed one to many times.... She will be back as soon as she sets back another bankroll. Very rare to see a player at that level just walk away for good. It happens but very very rarely does it happen when they are still up. Maybe she just feels she wants to do something else in life. Victoria Coren always does something else. Hopefully she’ll still turn up for the WSOP at least and maybe just retire from the traveling circuit. Always amazed when they retire so young, think lots of them end up unretiring like Timex did. A loss of the poker, I watched some tournaments her played, it's a amazing player! I wish all luck and I hope world of poker could have many amazing players like her. She will not be missed, every hand she is in she should win, or she complains .. very annoying to watch, and I bet play with. 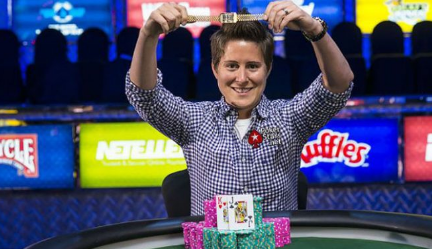 Pokerstars professional poker player Vanessa Selbst announced that she is retiring from poker because she claims that poker has changed a lot these years and poker has become now more a mathematical game than instincts-based game,particularly online I agree with her appointment because it is true that amateur find it more difficult to win at online poker .. What do you guys think ? SAd not to see that beuty playing poker. I am sure she has many other options! What? All she talked is about math if someone asked in the interview about the hand. She is fun to watch- her even tempered personality is one of a kind. Hope it's just a rumor. I never was impressed by her. Classic example of a knowledgeable player who went on a heater, then thought they could run everyone over.She made so many non gto blunders, mostly involving her zero equity bluffs, and thin overbets. Matter of time she would be busto. She can come back to poker when she learns to fold a few more hands. That was against pralad Freeman. He played like he had Aces. That should have been and easy read. I think he bluffed her the hand before too. Just one example of many times she has blown big stacks. she has a career on poker and wants to quit ....she must be really dissapointed .Also she doesnt want any more to promote online poker ,one of the poker pro team on PS ..i admire her for her honesty and maybe she needs to do other things. “I can’t tell amateurs they should come play online and it’s beatable for them when I don’t feel like it’s true,” she wrote. This a very telling quote and it mirrors how I, a nobody in poker feels. Additionally, from my perspective I think there is some rigging to the online poker “random’ software that ultimately benefits the house. Ultimately I think playing higher stake tourns online less frequently as practice to their counterparts in live action is the way to go. in the meantime whether rigged or not their are software poker designers and owners who have inside information and have access to the tables where as they should recuse themselves publicly. What do we really know about a deck of modern day playing cars – a lot, the software, not so much. Too bad online is fun and convenient, and one could play multiple games simultaneously. I’m playing in recent weeks my best online poker and I feel a great discomfort that these companies and software designers could easily quash if they were transparent. She probably has other plans to work or occupation to do. After sometime if she wants she can always come back. Vanessa has seen alot of bad beats in recent events, especially last year WSOP.What I totally understand is her getting tired of all the traveling she and most grinding pros have to do. he has never stayed in one place for more than a week the last 2 years. There's always doubt regarding integrity at poker sites online. But we have to trust that they are properly regulated or simply just do not play on them. Incredible player and ambassador. I was lucky enough to play vs her and know her. Will crush her hedgefund path as well im sure. Good to see a female player carry out aggressive plays like she did on the table...Isildur almost comes to mind but I think she didn't choose her spots wisely at times and you can't ride on 'instinct' long-term. travel from one place to another for game sounds like the real reason for player, and frequently travel by air is very tired for professional player , think esp for female. She may join the Cardschat freerolls now, I bet MTCash and Dougpkrmonsta would still cash in more than her.